Fans got a first glimpse of Season 6 at The Walking Dead panel at Comic-Con 2015. The sixth season of AMC’s highly rated drama picks up where Season 5 left off, and we will get to see how the people of Alexandria deal with the reality of the outside world. The reunion between Morgan (Lennie James) and Rick (Andrew Lincoln) will bring some additional tension into the community because Morgan has a different view of humanity than Rick does. These two men, who have at times had a similar path, have found ways to survive despite the inhumanity that surrounds them. Rick’s low tolerance of those who put his friends and family at risk may run counter to Morgan’s approach of leaving humans alive, even when they’re dangerous to others. Even Daryl’s (Norman Reedus) loyalty to Rick may be tested. 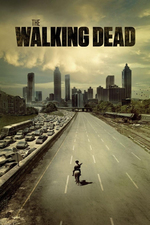 In the Season 5 finale “Conquer” Deanna (Tovah Feldshuh) and the people of Alexandria were shocked that one walker could get into their community. Wait until they see what’s in store for them in Season 6. The area around Alexandria has had relatively few walkers, but that’s about to change. In the upcoming season Nurse Jackie Emmy winner Merritt Wever will play a character from the comic and Ethan Embry, from Grace and Frankie, is also join the cast. Executive Producer Scott Gimple will return to helm for Season 6. Lennie James will become a series regular. During the comic-con panel Gimple revealed that we will learn more about Morgan’s journey through a series of flashbacks. The Walking Dead Season 6 will premiere on Sunday, October 11th with an extended 90-minute episode. If you can’t wait until the fall for more walker action, AMC’s summer series Fear the Walking Dead will begin airing August 23. For more recaps, photos, and news about The Walking Dead and other shows like iZombie, Wayward Pines, Doctor Who, Game of Thrones, and Supernatural, subscribe to receive notification of new spooky content by email. Or you can follow us on Facebook, Twitter, Tumblr, Instagram and Google+. Check out our Monsters of the Week and other scary and supernatural posts. I have to start watching this.